This assortment of highly interactive worksheets is designed with the sole purpose of making learning fun! Our easy-to-print worksheets feature a rib-tickling riddles that are sure to crack up young ones and grown ups alike! 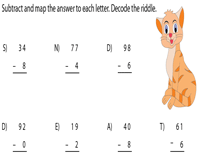 Children will need to solve a range of subtraction problems that feature numbers from 0-10 and 0-20; 2-digit minus 1-digit subtraction; 2-digit, 3-digit and 4-digit subtraction to decode the funny riddles. These worksheets form an ideal tool to teach subtraction while keeping them engaged with whacky solutions that follow! Use these colorful and highly engaging worksheets to assist your little ones with subtraction of numbers up to 10. 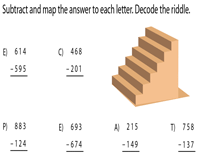 Map the differences to break the code to arrive at the fun-filled answers! Learn to find the difference in numbers up to 20 with this vivid array of printable worksheets! 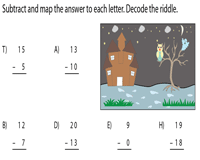 Children need to figure out the rib-tickling answers to the riddles by solving each subtraction problem displayed here. Explore this series of theme-based worksheets that require children to subtract single-digit numbers from 2-digit numbers. Solve the subtraction sums to crack the code and unravel the witty answers! Add some fun and sparkle to your kid's daily routine by getting them to solve this collection of delightful riddles! 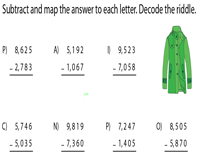 Subtract all the 2-digit numbers featured in each worksheet and decipher the code to reveal the whacky solutions! Employ this ensemble of immensely interactive worksheets to arouse your child's curiosity in solving these riddles. 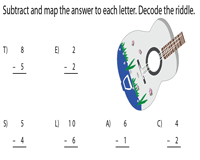 Aid them to solve 3-digit subtraction problems to arrive at the extremely amusing answers! 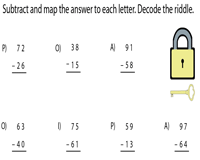 Solve this selection of worksheets based on 4-digit subtraction to decode the solutions that are sure to tickle your funny bone!